This poor street sign is a little worse for wear. It hasn't been up since 1827, but the University of Toronto, which has several of its buildings in this area, has been around that long. Indeed, Queen's Park itself is an enclave of the University (with a 999 year lease since 1854) which occupies most of the surrounding land. 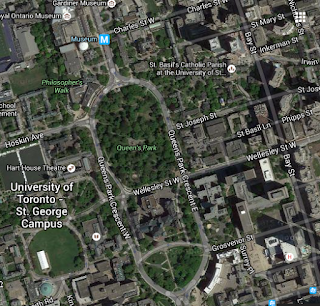 Queen's Park Crescent is the continuation of University Avenue and encircles the park. Inside the southern portion of the park (owned by the Government of Ontario) stands the Ontario Legislative Building. As often happens, the building and the government are simply called 'Queen's Park'. The "Queen" in this instance is Victoria as the park was opened in 1860. 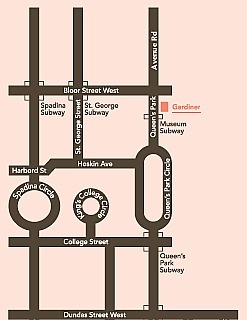 Interestingly, it is very common to not include the road/avenue/street designation when speaking of an address so the street is also just known as Queen's Park. 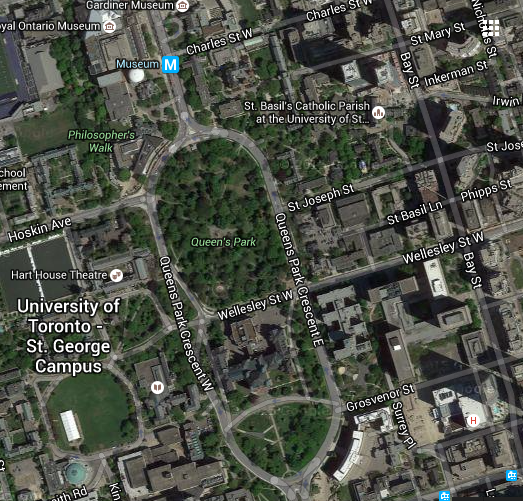 And if pressed, I would have said it was Queen's Park Circle. As it is in this map. That old queen sure gets around! She was a favourite in many countries - none of which she ever visited. A 999 year lease should protect this land for many generations to come. One might think that someone could clean up that sign. The rust seems to be coming from the metal frame, not the sign itself. Good post. It was a prudent deal. And it wouldn't surprise me if new signs are in the works. Those old "Acorn" signs are slowly being replaced with modern ones. Too bad. The are a favourite of people who pay attention to such things. With the rust, this sign looks possibly older than it is with the rust. I rather like the newer colourful street signs with their neighbourhood designations. But, I wish they were in this old 'acorn' style. Even the new ones that are in the acorn style look wrong, somehow. Maybe because they aren't porcelain. I also like the neighbourhood signs. Though there seems to be many more 'neighbourhoods' sprouting up! The university emblem looks impressive on this street sign. It's a bit hard to see, but it is officially impressive, I agree. Though the sign has some wear, I'm sure it's sturdier than the newer ones. Berlin still has some oldies too! These were meant to last forever.